Baseball is what I did. It was never who I was. My goal in life was to love God and other people, and I've always tried to use my platform for good. It just so happened that the 2013 injury forced me to focus more of my efforts off the field. 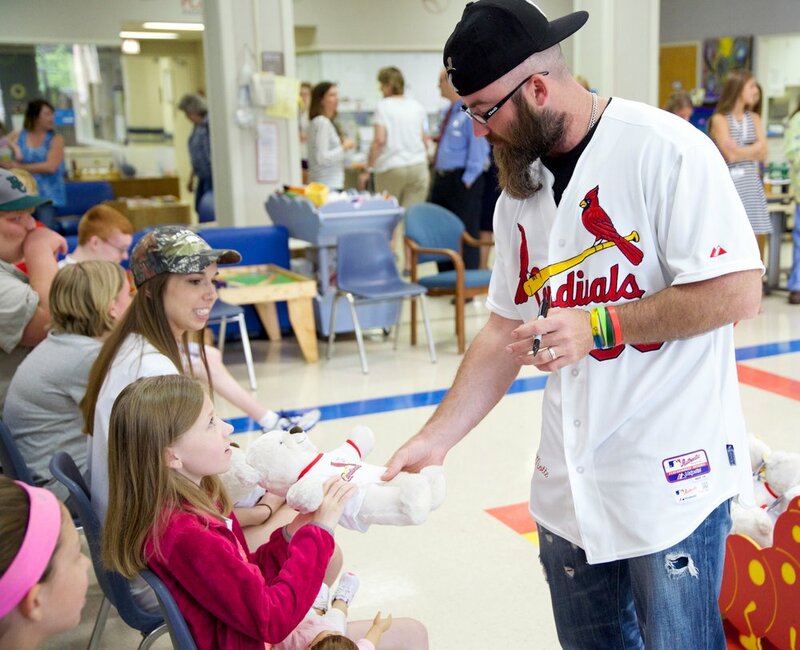 My wife and I decided to spend more time with the Jason Motte Foundation, with the goal of striking out childhood cancer. We met so many incredible kids that year, like a little boy named Brandt Ballenger and girl who went by the name Princess Ari. Even if I was able to get their minds off their cancer for five or ten minutes that day, it was worth it for me to go visit them. It might sound hard to believe, but I had a lot of fun that year. Even though rehab is never easy, it's a lot easier when you're surrounded by incredible kids. It also helped put things into perspective....am I going to sit there and complain about having surgery when there's a kid getting chemotherapy and radiation? I think one of the coolest parts was that just as the kids found inspiration from me, I found inspiration from them. I would give them an autographed ball they could put next to their hospital bed, and in turn they had bracelets with their name they would give to me. I still wear a bunch of them to this day. In fact, if you were to see the inside of my truck, you would see even more. But here's the thing about childhood cancer: it doesn't stop spreading just because you have a positive attitude. On July 23, 2013, my buddy Brandt passed away. I think for many people, this is proof that God doesn't exist. Why would a loving God put this 9-year-old boy on this Earth to suffer and die of cancer? But I think my whole life was evidence that I shouldn't question God's plan, because of all the hidden treasures behind my adversity. Even if Brandt was on this earth for 9 years, they were still 9 years worth living. I had just become a dad, and Brandt made me a better father. Princess Ari made me a better husband. I remember at one point my wife asked me if I was doing okay. I hadn't had that moment of anger yet, of someone who was trying to fight my circumstances of not playing for a whole year, and she was concerned I was bottling it up. "Are you going to go crazy at one point? If you do just let me know," she would say half-jokingly. "I'm good," I would tell her, and thanks to people like Brant and Princess Ari, I really was. With an improved perspective, I watched with joy as Edward Mujica became an All-Star in my absence. Trevor Rosenthal ended up taking over as the closer late in the year and was phenomenal with a 2.63 ERA. Those guys led the Cardinals all the way to a World Series appearance. I didn't get to be on the field for that one, but it was the one two years earlier that I'll never forget. And if you were in Busch Stadium for Game 6, you probably won't either.